Apple: Does This Spaceship Make My Glass Look Big? Apple’s proposed new “spaceship” building in Cupertino features curved glass and an engineering challenge that makes solving the antennagate and white iPhone problems look cinchy. 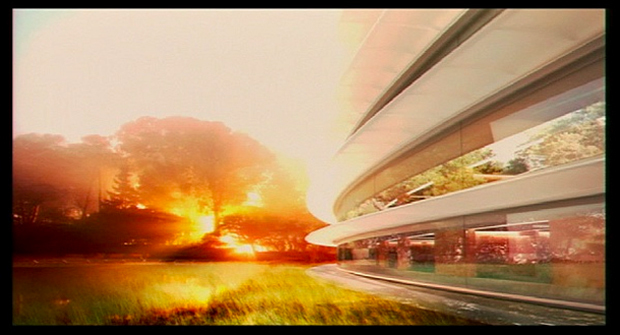 Apple’s proposed new “spaceship” building in Cupertino may be made largely of huge sheets of curved glass. It’s an aesthetic choice, and a very expensive one. But not too tricky for one of the world’s experts in huge glass architecture. Now, we’re not sure every sheet of glass in the building is curved and there are certainly ways to use flat sheets of glass to make a curved glass-fronted building. Or even a circular one. But Jobs is insistent on the curved glass model–despite the expense–and it’s probably for two reasons. A large curved sheet of glass doesn’t flex as much as a flat one, and has added structural strength compared to a flat one–meaning you could clad more frontage with a curved glass sheet than a flat one. And it’s an aesthetic choice, since a flat, segmented window facade would need more joins and supporting substructure, each element of which would interrupt the otherwise sleek look. With a curved glass “face,” Apple’s new building would thus ascribe to the smooth, sleek design aesthetic of Apple’s products. But does Apple really “know how to make the biggest pieces of glass in the world for architectural use?” It’s totally plausible. Look at the iconic Fifth Avenue store in New York–little more than a 32-foot-high all-glass cube above ground, with the rest concealed in a basement. That little glass cube has become almost as photographable as the famous glass pyramid at the Louvre, and this older structure has way more superstructure built in. Remember the fist-thick glass steps in London’s Regent Street store, which were so unusual when they arrived back in 2004 they encouraged visitors to traipse up and down them? Then look at the Shanghai store–a development on the New York cube that hints at Apple’s new campus design. It’s another all-glass entrance lobby, this time a 40-foot-high glass cylinder whose uninterrupted glass segments are the largest sheets of curved glass like this in the world. 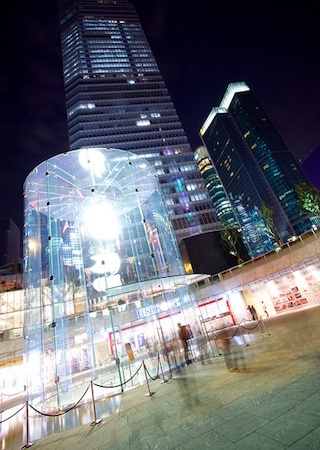 Next up is Apple’s Sydney store, which has 15-meter (45-foot) flat glass windows which are, according to Apple, the largest plates of laminated glass in the world. 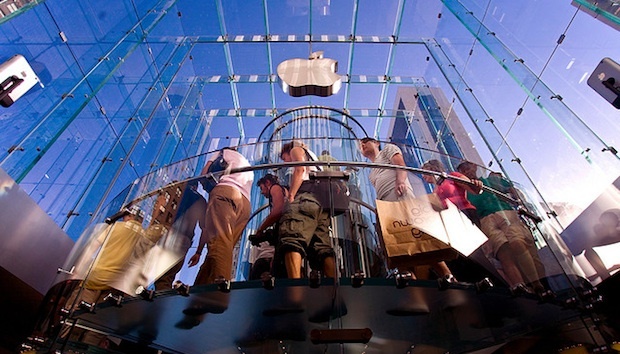 When one of the store’s windows cracked in 2009, Apple had to have a special piece of machinery built in Germany and then shipped to Australia just to lift it, and the repair cost well over $1 million. Apple’s glass windows have caused repeated crime problems in their stores too–just last week a thief attempted to smash his car through a store front to steal Apple gear from the shelves, only to flee after his car shattered the glass. Did the extraordinary noise it must’ve generated scare him? Of course break-ins like this won’t be a problem in Cupertino. And in conclusion, yes…we do tend to believe Jobs’ assertions his computer firm is now an expert at applying massive sheets of glass to solve architectural problems. The glass could even help the building attain some of its promised green credentials too–treated with the right chemicals as a filter, it could act to trap sunlight inside and reduce the need for heating. We just have one question for Steve. Has he ever been to Cheltenham, England? You know, the home of famous horse races, hats, posh private schools, and the U.K.’s Government Communications Headquarters. 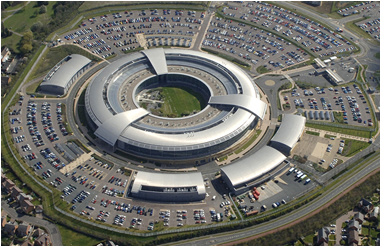 GCHQ, spy-central for the Brits. A glass-fronted spaceship-like ring, with glass-roofed atria, good green credentials, and a private-access garden concealed inside the giant “O”….